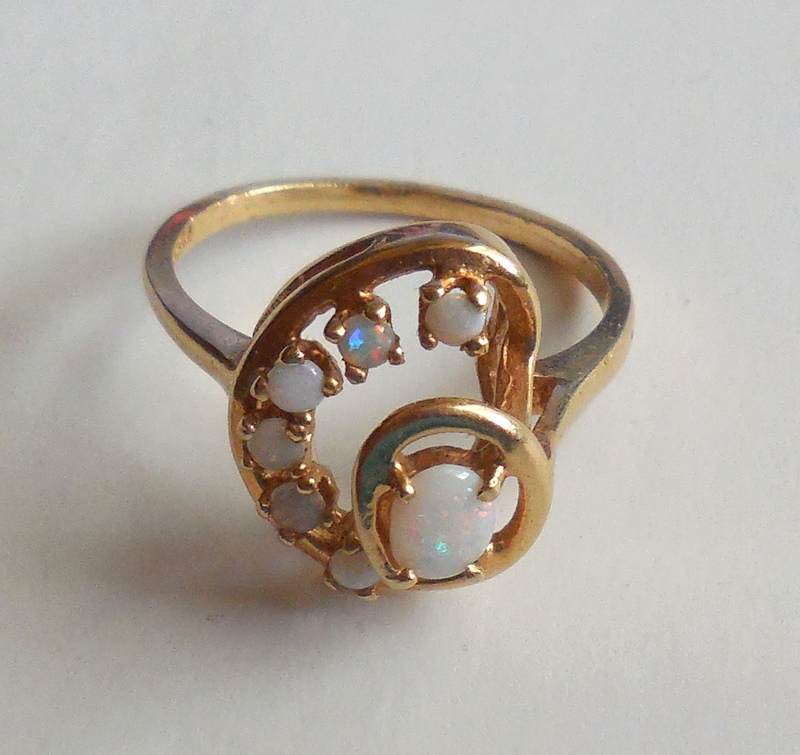 1980 Mid Century Modernist 14K Gold Opal Swirl Ring Size 6.25 – Vintage mid century 1980s jeweler estate ring originally used for display. 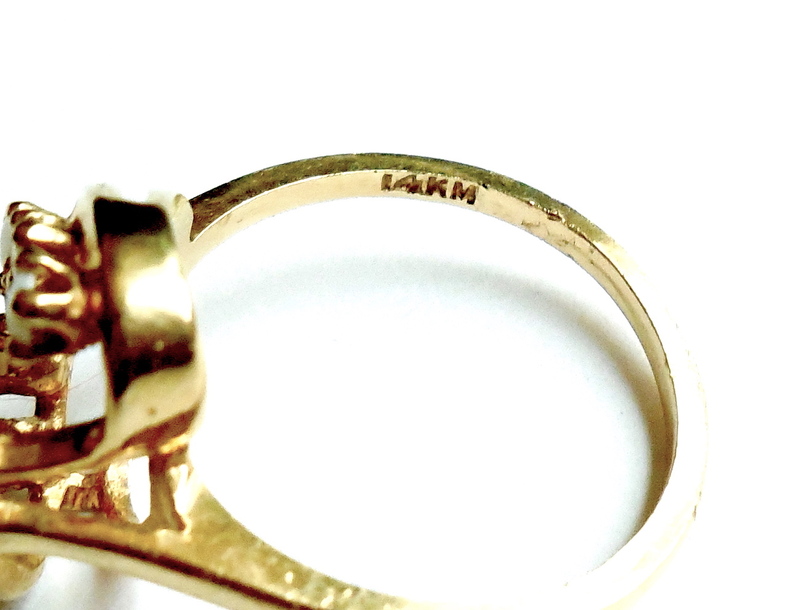 It is marked 14K, tested and guaranteed solid 14K YELLOW GOLD. Their is minor edge wear inside the band on the edge where it was filed for testing. 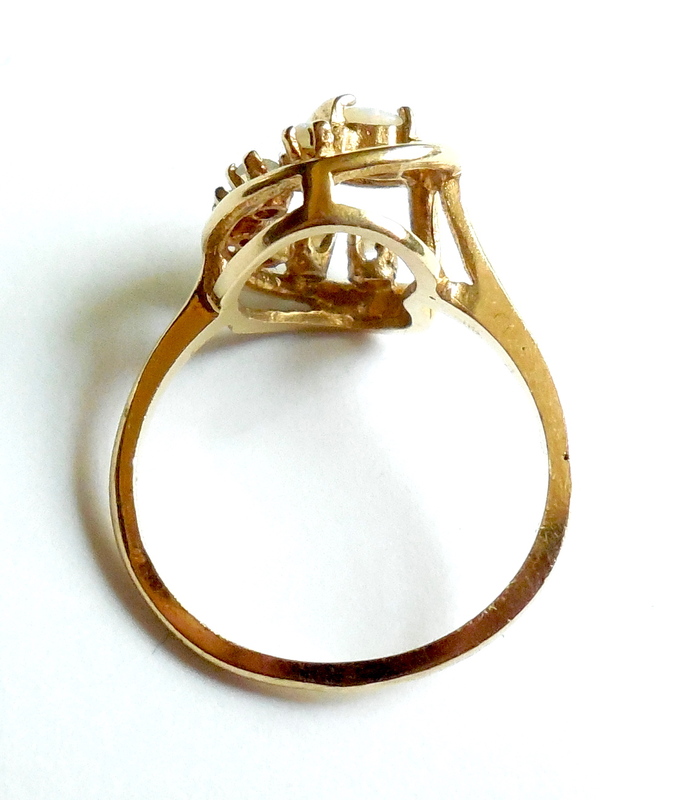 Other than this it is in original, crisp, clean, excellent condition. All original. No damage or repair. All good stones. 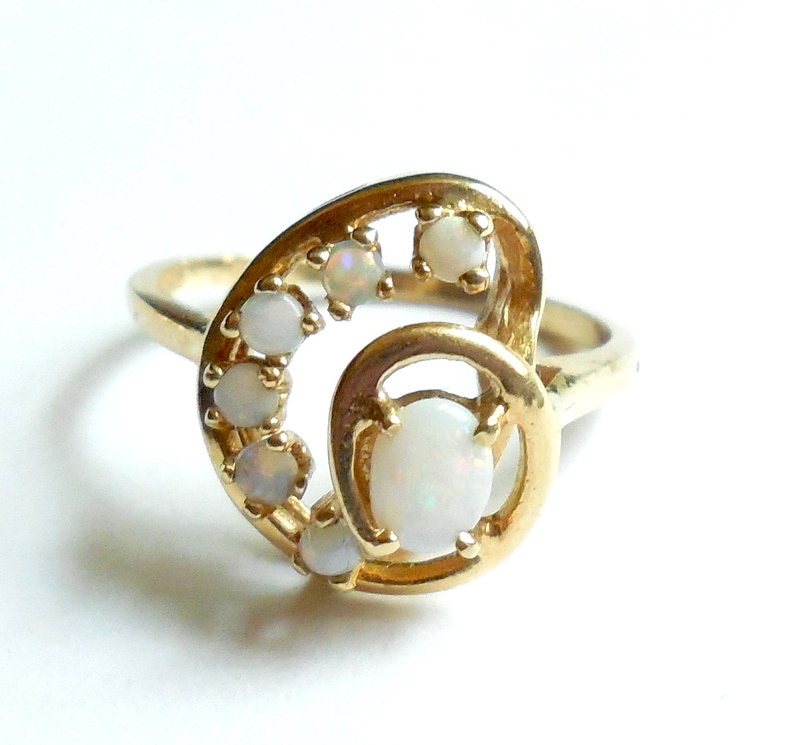 The top has a late mid century swirl design which spirals outward with the opals. Just the top measures 1/2″ north to south by 7/16″ east to west. 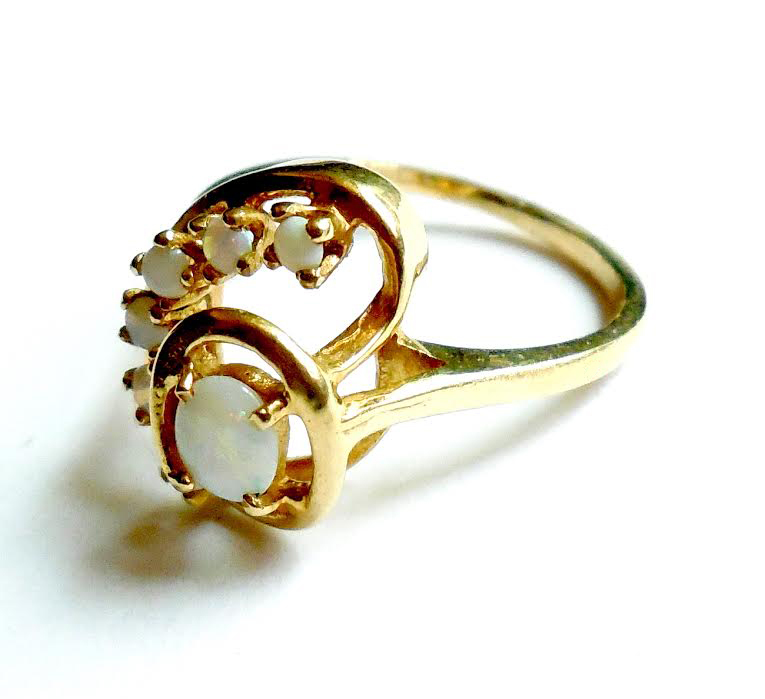 Height above the finger line is 1/4″ from the finger to the top stone which is a little higher in the setting than the smaller stones given the design. 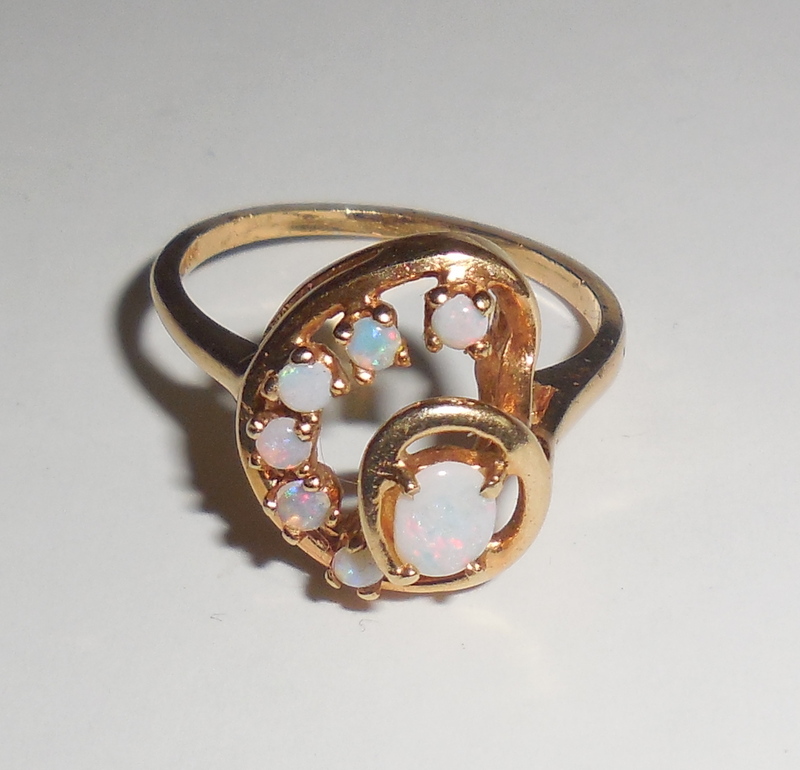 The opal cabochons around the outer section are 2mm each and the center opal cab is 5mm by 3mm. 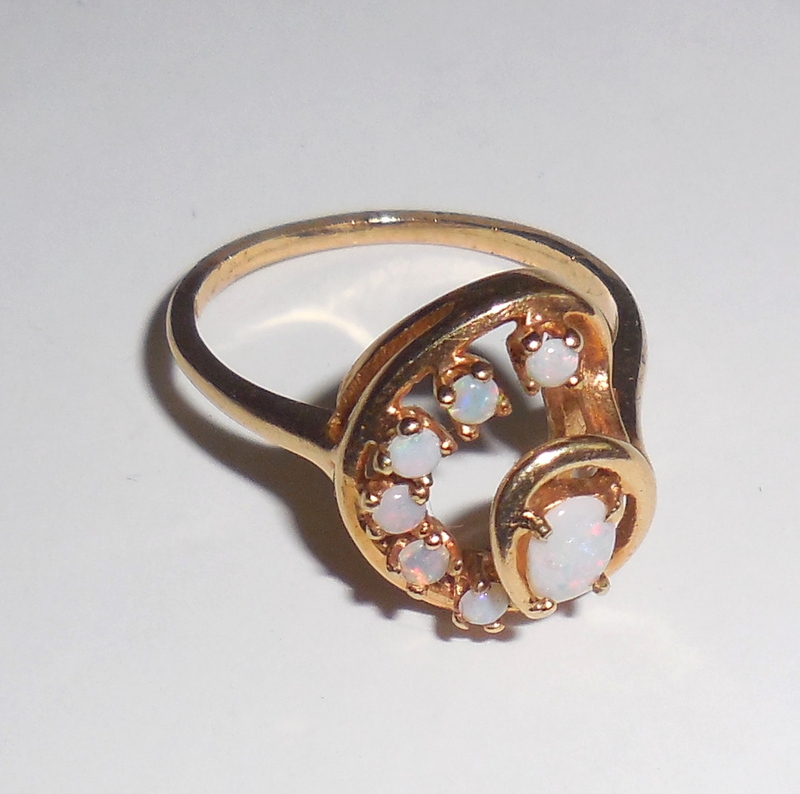 All are pale blue milky white with neon pinks, reds, greens, aquas, blues etc…. 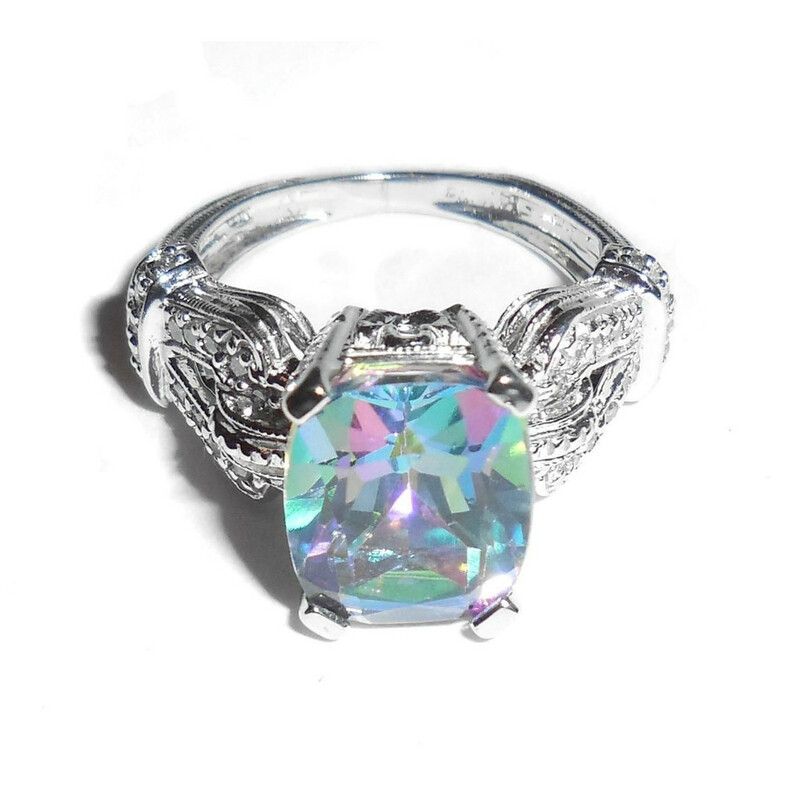 The natural blue color is very, very pretty and all colors can be seen best in the last photos which were taken with lighting or flash. 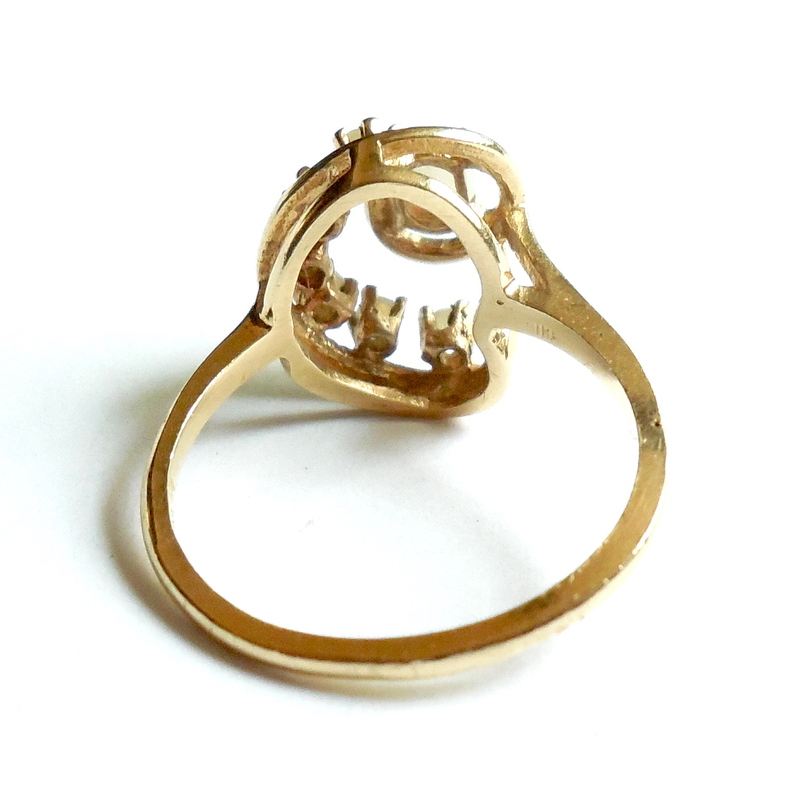 Ring size is 6.25. Weight is 2.9 grams. Overall excellent condition. No damage or repair. 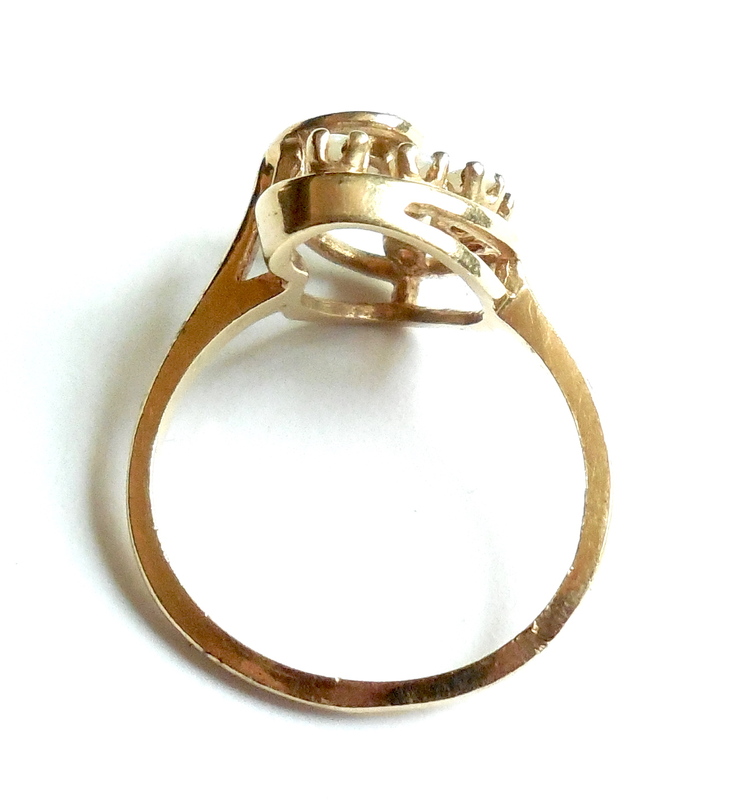 This is a lovely ring for your fine jewelry collection and good for every day use. 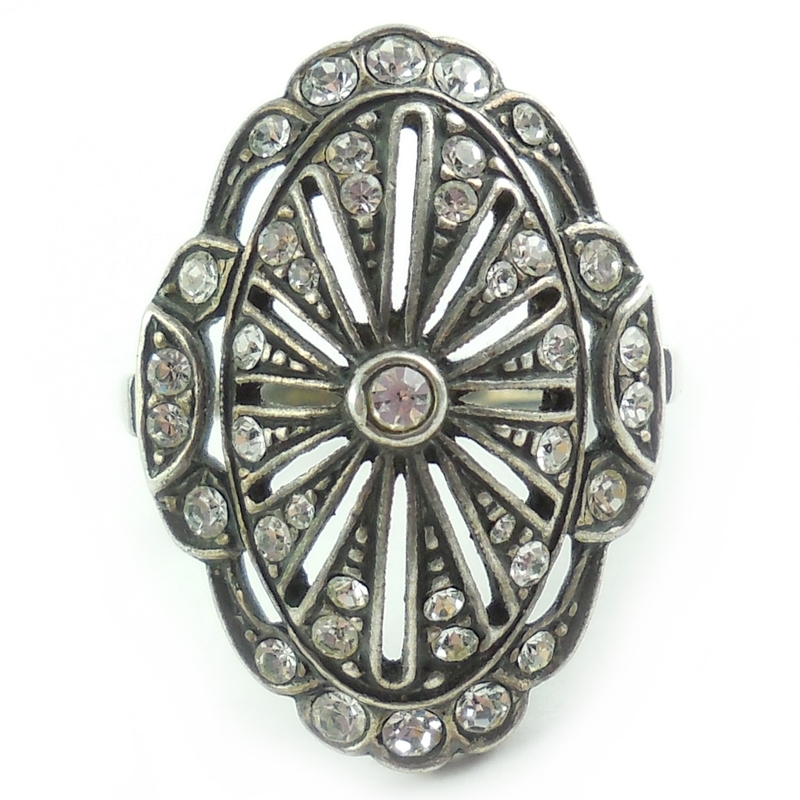 Stunning Vintage Sterling Silver Long Fancy Filigree Paste Ring Age: Closed Drop Backs; Likely Mid Century Stones: European Cushion Cuts Metal: Sterling Silver with 925 marking. 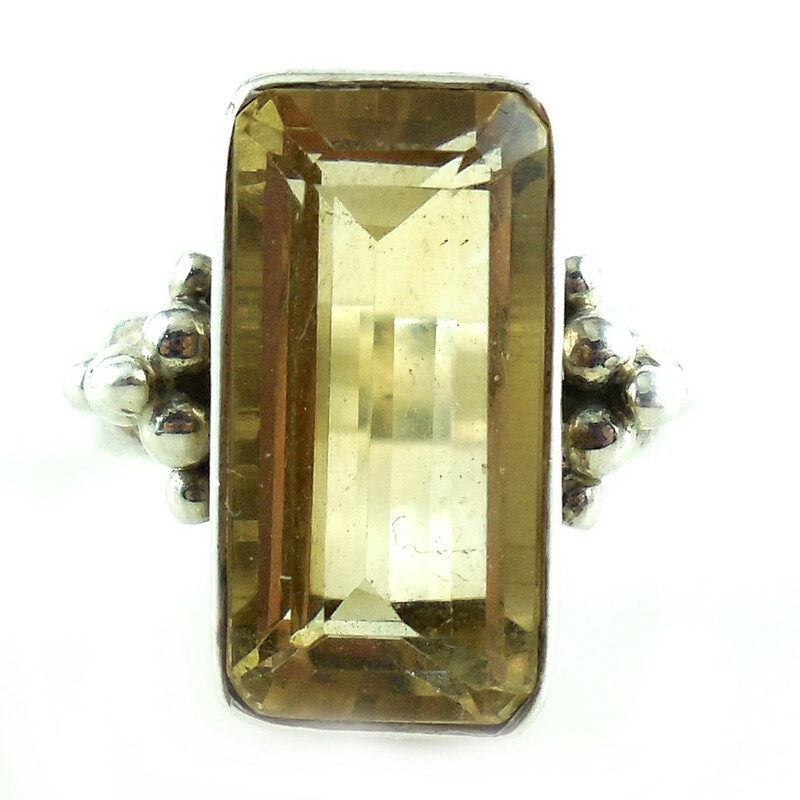 Size of Top: Just about 1" long by 5/8" Ring Size: 8 Condition: excellent, no damage or repair. 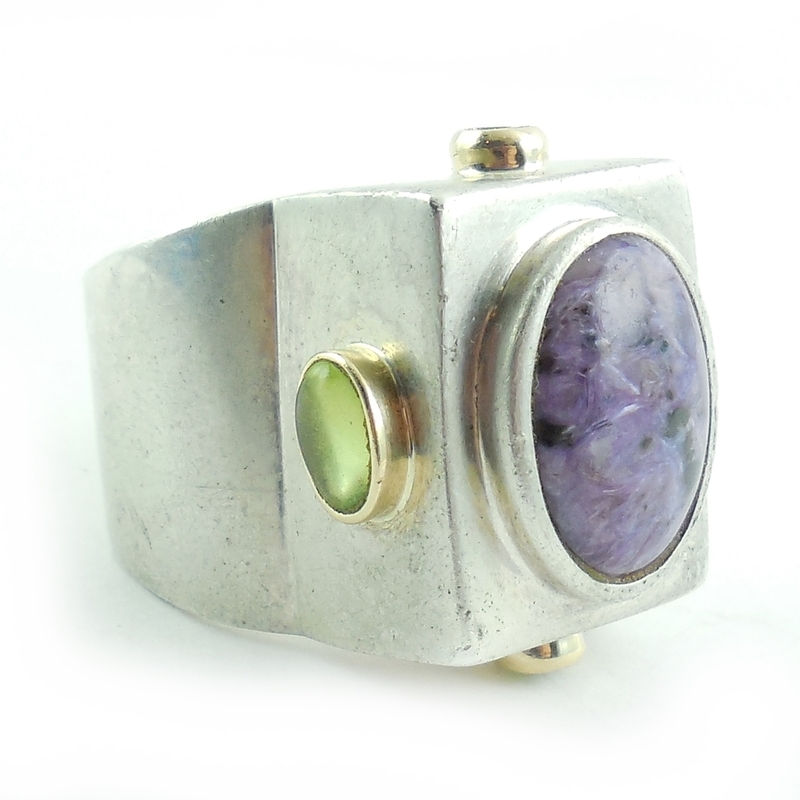 Please see photos and read full product description below. 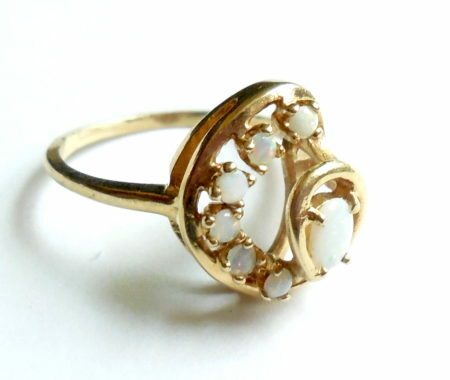 This is a lovely ring for your fancy vintage jewelry collection.